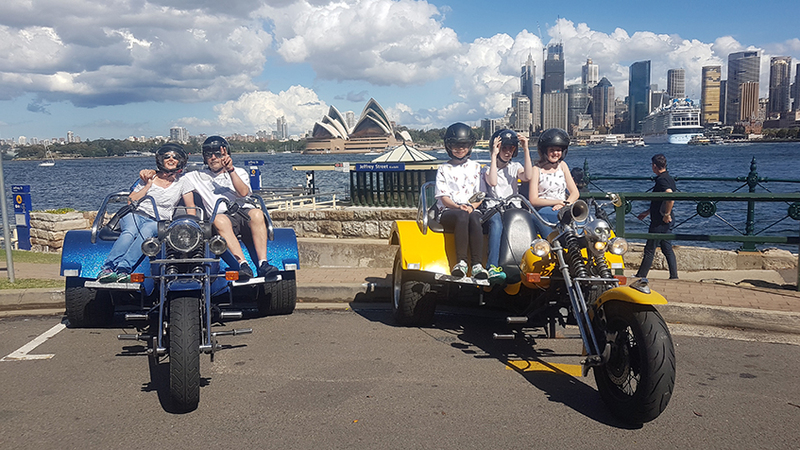 Yasmin organised the family exploration trike tour with us. She and her parents are in Sydney for a holiday and thought this would be a great way to see the sights. It sure was. They saw more than they thought they would. Craig picked them up near their hotel in Haymarket. Sometimes we can’t pick pour passengers right out the front of their hotel because of the road works being done around Sydney. We will always work out the closest and safest place to pick up if we can’t pick you up directly out the front of your hotel. Craig firstly rode to the Domain-Yurong Precinct. There is a wonderful view to the west, over Farm Cove to the Sydney Opera House and the Sydney Harbour Bridge. We ride past Mrs Macquarie’s Chair though you can’t actually see it. It is a stone bench wiht views to the harbour. They continued back past the Art Gallery of NSW to the Domain. Next they joined the Cahill Expressway. This takes you above Circular Quay with a lovely view towards where the ferries come in to Circular Quay. The Cahill Expressway brings us onto the iconic Sydney Harbour Bridge. It is wonderful to travel over ‘the bridge’ without a roof over your head. You can really appreciate the arches and architecture a lot more. Craig rode to Blues Point firstly. There are great views east towards the Opera House and the Harbour Bridge. 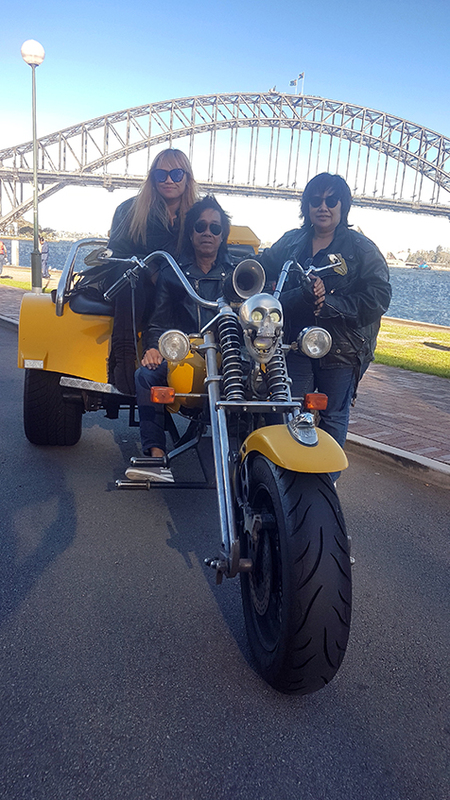 Next they rode to Jeffrey Street Wharf at Kirribilli. This place also has great views towards the Opera House and the Harbour Bridge. It is from quite a different perspective than Blues Point. 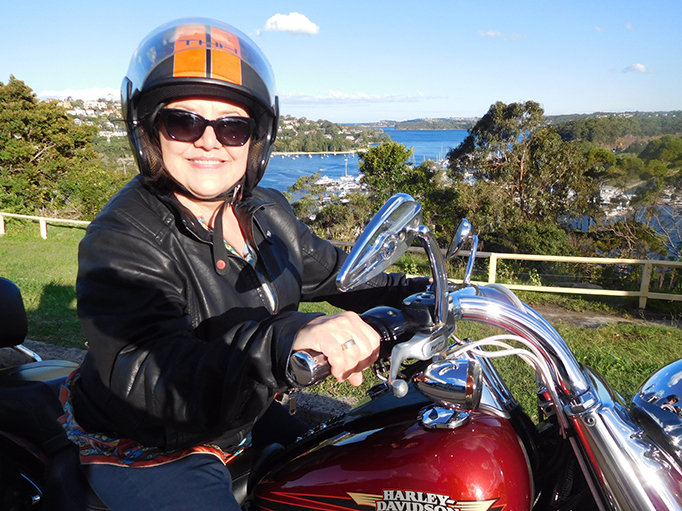 They rode under the northern end of the Harbour Bridge, past Luna Park and the North Sydney Olympic Pool. They rode back over the ‘the bridge’ to Chinatown. It is always an interesting place to look at. Then our passengers were dropped back at their hotel. A great time was had by all! A family exploration trike tour is a wonderful bonding time. We can organise one for you and your family (or friends).